The courageous, some might even say foolish, man heads out into the U.S. economy. GRAND RAPIDS, MI—Steeling himself against brutal market conditions and an unforgiving fiscal climate, fearless local man Calvin Ordway boldly set out into the U.S. economy this week, sources close to the 32-year-old confirmed. 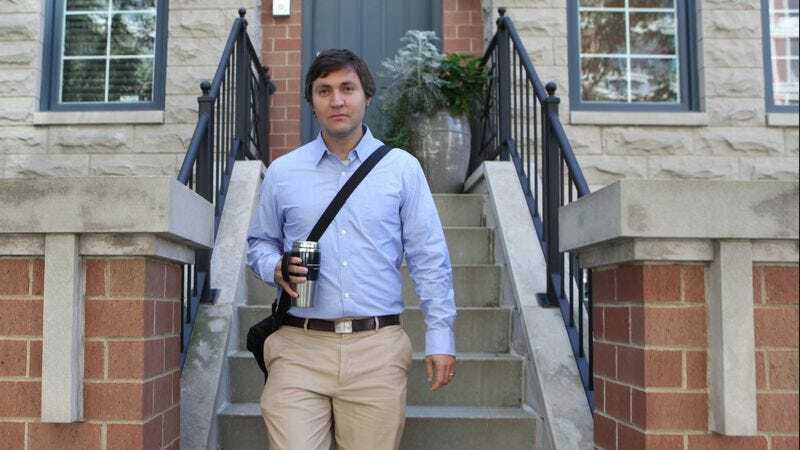 Clad in a dress shirt and khakis, armed with only his wits and basic computer skills, Ordway reportedly showed no hesitation as he opened his front door and strode through the breach into a bleak economic landscape where there likely exists absolutely no demand for any task he can perform or product he can create. “God help him,” Weiss added. According to sources, the college-educated Ordway entered the economy despite knowing it to be almost entirely devoid of revenue streams—and knowing that while his chances of finding profit in the barren, sparse wasteland were exceedingly small, the likelihood he would lose his way and fall victim to financial exposure was quite high. Ordway was last seen behind the wheel of a 2001 Toyota Camary with 200,000 miles on its odometer, driving in the direction of a job believed to be located in a particularly tempestuous and unpredictable economic sector. Ordway’s wife, Louisa, meanwhile, expressed different concerns. While the motivation for Ordway’s daring trek remained uncertain, reports indicated he may have set forth on a quest for the fabled treasure of middle-class respectability said to lie hidden somewhere in the nation’s deepest economic recesses.